The southern half of the South Island of New Zealand is home of Alpine Valleys connected to the West Coast, where the landscape is dominated by Quaternary Glaciation products. In the present climate, the ice has been retreating at the Quaternary scale and it has been moving forward and backward at the historical scale, with a general retreating trend. Those multiscale changes are then at the origin of several challenges for the population living on the West Coast of New Zealand. Indeed, as Quaternary scale large glaciers have “disappeared,” a postglacial rebound, or debuttressing, has been occurring through the temperate mountain environments, generating mass movements and sediment releases in the valleys (Fig. 1). This effect is accentuated with glacial retreat, which impacts sediment transport and downstream hydrology. To this general framework, the West Coast glaciers have positioned their terminus at low altitude because of the important precipitation in altitude. Consequently, the connected tributaries in the lower parts of the glacial valleys have accumulated debris flow and fluviatile sediments behind the ice, as the processes of these tributaries were not governed by glacial processes but by more “temperate” processes. As the glaciers are now receding to their lowest extend for centuries, the sediments trapped in the tributaries are released, sucked in the main valleys, because of the sudden lowering of the base level—the previous base level was the glacier surface elevation, now it is the river bed—and eventually because of the unwelding of rocks and ice, due to ice melting. These processes then in turn create issues downstream with sediment accumulation and transfer, threatening infrastructures and settlements like at Franz Josef (Davies et al. 2013). It is therefore critical to be able to generate topographic dataset of those areas in a very short period of time. Periods of transition in landscape construction might just be the norm compared to any form of stability, even if geomorphologists have tried to define landform evolution and transformation linked to sets of processes, suggesting that there exists a format for a given landform, even a state in the evolution if one refers to the early twentieth century Davisian theories of geomorphology and landscape evolution. Nevertheless, glacier valleys and the sediment transported through them are in constant evolution; often difficult to predict, because one needs to place present processes and landforms in a continuum of past processes and landform legacies, in order to understand present day events. 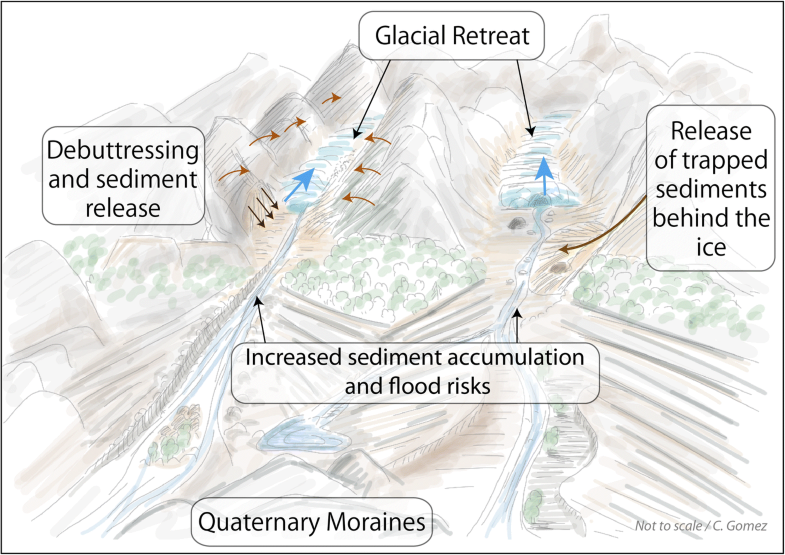 Of particular interest in the present contribution is the role of the Quaternary glacier that have left important moraine deposits, organized in arcs in valleys and floodplains, acting as dams for sediment, which will tend to inflate in those areas (Fig. 2). 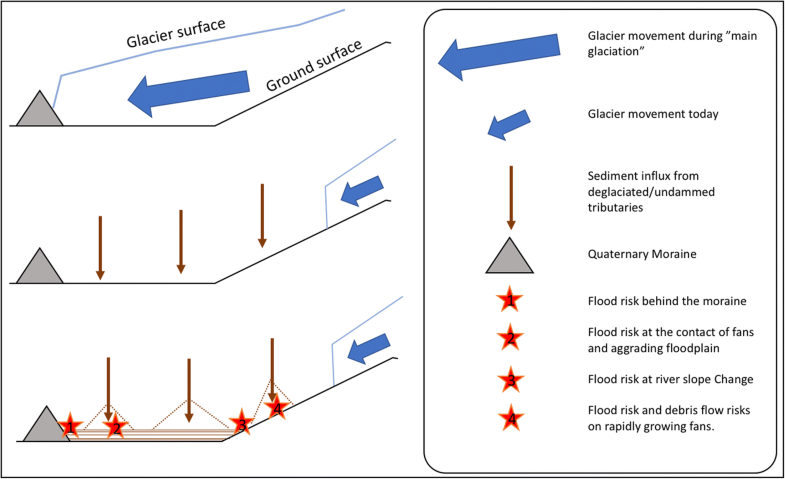 This legacy influences sediment deposition, but what we have known in the past few decades is likely to change again with the progressive recession of glaciers, which are freeing sediments with new regimes, in turn generating floods and other sediment-laden flow hazards (Fig. 2). Some of those pressure points are places where sediments can be stopped, such as the back of moraines (1 in Fig. 2), at slope changes between forming fans and aggrading floodplains (2 in Fig. 2), where the main valley slope changes because either of sediment accumulation or new stretch of valley opening with glacier recession (3 in Fig. 2) and finally because of modified geometries of existing or newly created fans, mostly because of changed sediment transports, but also due to human influences (4 on Fig. 2). Debris flows are saturated mixtures of water and dry material ranging from fine sediments to large boulders, eventually including bio-debris (such as trees), which flow rapidly by gravity, waxed by the mélange of fluid and fine sediments (e.g., Vallance 2005; Hungr et al. 2014; Takahashi 2014). Debris flows are recurrent events that can have cause severe damages (Cui et al. 2015; Badoux et al. 2016), and their frequency notoriously increases after earthquakes because of the material readied for remobilization (Tang et al. 2009) and after mountain fires. The water content in debris flows can originate from different sources (lake outburst, integration from river water, etc. ), although in mountain areas, rainstorms dominate debris flow triggering and occurrence (Wieczorek 1987; Wieczorek and Glade 2005), making them difficult to predict (Marra et al. 2017), especially because the role of predisposing factors such as antecedent rainfall can be difficult to quantify (Bel et al. 2017). Consequently, recent research has shown that climate change will have impact on their amplitude and frequency (Gariano and Guzzetti 2008; Dietrich and Krautblatter 2017). One of the common countermeasure for debris flows are different types of check dams, slit dams and deceleration baffles, the most famous series of which being the SABO dam systems developed by the Japanese, such as the ones that belt Unzen Volcano on Kyushu Island in Japan (Gomez and Wassmer 2015). When debris flows leave the mountain areas for the surrounding plain, their sudden loss of energy generates sediment deposition, creating semi-circular structures named fans or cones. Sedimentary fans are conic landforms that connect a steep valley to an area of lower slope gradient. The sediment accumulation is related to the slope gradient change and the consequent loss of energy (Harvey 2011). Fans can be either dominated by stream-flow, in which case they are named alluvial fans, or dominated by debris flow processes, in which case they are named either debris flow fan (the terminology used in the present publication) or debris flow cones. Debris flow fans develop through complex series of processes, including backfilling, avulsion, channelization, which occur through successive debris flows as shown by laboratory experiments (De Haas et al. 2016). Those natural processes are also influenced by human impacts and the reworking of fan surfaces, such as controlled channelization for instance (Wasklewicz and Scheinert 2016). In such environments, the security of the public using those tracks rely on a good understanding of the geomorphology at a given time and how this latter influences the flows that occur at its surface. The present contribution consequently focuses on the fan of Yellow Creek, in the Fox Glacier valley of New Zealand (Fig. 3), because it is one of the largest interfaces transferring sediments to the valley and also because the tourist track crosses it for almost a kilometer, eventually putting tourists at risk during floods or debris flows. Presently, the valley is managed by the Department of Conservation in collaboration with the Fox Glacier guide and the valley is closed to tourists when potential hazards are forecasted or evidenced. In such environment, it is therefore necessary to collect high-resolution topographic dataset at high frequency to keep up with the geomorphologic evolution and the changing hazards. The study area is located on the West Coast of New Zealand, in the 2 km downstream the glacier terminus (as per its location in ~ 2015). If the adjacent valley still has prominent moraines that are visible across the coastal plain (as in Fig. 3), the Fox Valley is at a stage, where the moraines that could play a role in trapping sediments have already been buried (if they exist, and this is a long-standing discussion). We are thus already operating in a sedimentary environment that aggraded when the present glacier recession started to occur. If the long-term issue is for the settlements on the coastal plain of the West Coast, who see the release of temporarily trapped sediments from the Alpine catchments, issues also arise in the upper part of the catchment especially because infrastructures located in the Alpine Valleys themselves are potentially at risk of flood and other sediment-related hazards (Purdie et al. 2015). A location where this problem is particularly acute is the Fox Glacier valley, located upstream of the Fox valley township, which has developed over the alluvial fan of the river, and the aprons of the Southern Alps. Before emerging from the Southern Alps, the valley count 6 major fans that have formed in the valley following historical glacial recession (Purdie et al. 2014), of which 4 are located between the car park and the “point of view” where the tourists go and watch the glacier (Fig. 3)—with an annual influx of about 700,000 tourists (www.westcoastnz.com). Purdie et al. 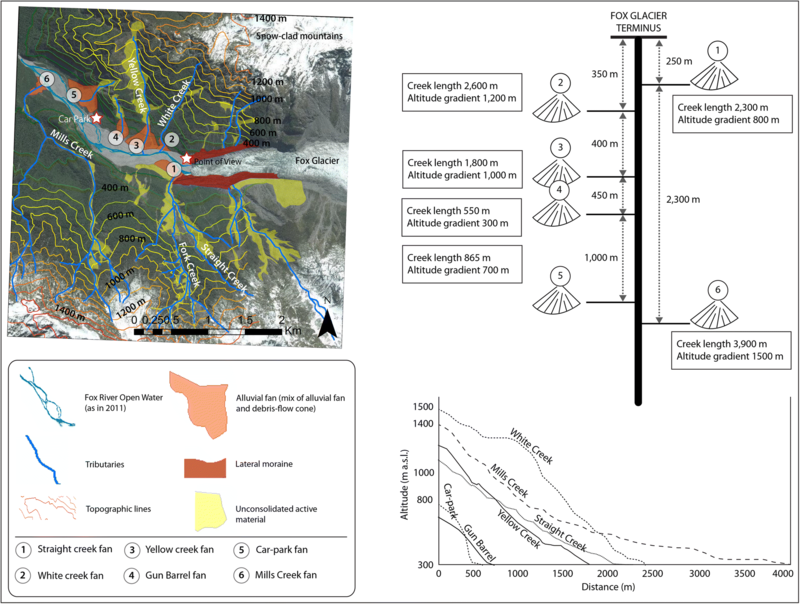 (2014) demonstrated that at Fox Glacier, this process of glacier recession was very rapid, with the glacier being more than 15 km long in the late nineteenth century and between 12 and 13 km in length in 2014. Hence, the tributaries along a ~ 2.5-km length have been freed from their “ice-cork” accumulating important amount of sediments at the junction with the main valleys. Although those valleys have already created very large fans, the longitudinal profiles indicate that the sediment reservoir is far from empty (Fig. 3), with also nonlinear transfer fueled by the landslides like the one that can be seen in the Yellow Creek catchment (Fig. 3). The present contribution is articulated around field-data from Fox Valley, New Zealand, and numerical modeling of flood water on fans. The field data is comprised of aerial photographs taken from helicopter (250 to 300 m from the ground) and from a Quadcopter UAV-phantom 2-Vision+ (9 September 2015), in order to perform SfM-MVS photogrammetry and generate a 3D point cloud of the studied surface (Fig. 4). The camera used in the helicopter is a Samsung EK-GC200 Camera with a 86.1-mm 4.1 focal length, with photographs recorded with a resolution of 4608 × 3456 pixels. The UAV-based aerial imagery is a set of 320 photographs taken between 60 and 80 m above the ground using a camera angle tilting of 0° (perpendicular to a horizontal imaginary plane) and 20°. Both the Samsung camera used in the helicopter and the camera on-board the UAV use an integrated GNSS, and the target on the position of the features was then corrected using the Trimble R8 RTK-GNSS. However, if the Phantom 2-Vision+ corrects the distance between each camera position using its internal accelerometer, the GNSS receiver integrated to the Samsung camera in the helicopter is not equipped with the same feature, and the GNSS positioning was of too low spatial resolution, presenting delay in the position acquisition; therefore, the spatial data from the Samsung camera were ignored during calculation, and only the ground controls were used to calibrate the models. The spatial position and accuracy of the 3D point cloud generated by photogrammetry was corrected using geodetic points. For this purpose, we used a Trimble R8 base-station and a Trimble R8 Rover, using the RTK-GNSS (real-time kinematic—differential global navigation satellite system) method and a recording time of 4 s at each point. To ensure a perfect connection between the base-station and the rover, a relay radio was set in the central part of the valley on a topographic high. The RTK-GNSS dataset was collected on the 19th September 2015 between 9.30 AM and 4.00 PM. The RTK-GNSS data includes 3 files (441 points, 331 points, and 23 points) used to constrain the model (Fig. 4). The imagery and the RTK-GNSS data were brought together in the software PhotoScan Professional Edition (Agisoft LLC), in order to derive a 3D point cloud dataset by using the Structure from Motion and Multiple View Stereophotogrammetry method used in geomorphology at various scales (Gomez 2014; Gomez et al. 2015; Mosbrucker et al. 2017). The dataset was calibrated using a set of 12 points marked on the ground using a visible target. Once the sparse 3D point cloud is created, further vertical correction was performed by forcing RTK-GNSS data to the point cloud, reshaping it. The generated point cloud presented a deviation (positive or negative) ranging from < 5 cm to locally ~ 40 cm. As the altitude in the survey area varies between 241.3 and 292.58 m, the maximum recorded error only represents 0.78% of the vertical variation and can be neglected. The produced data were then brought in the Geographic Information Sciences software ArcGIS ArcMap commercialized by ESRI, in order to proceed to the geomorphological analysis and also prepare the data for running the flow simulation, where a 50-cm horizontal resolution grid was created. The Nays 2-D model is a computational fluid dynamics (CFD) flood model for unsteady 2D depth average flow, which uses curvilinear fitted coordinates (i.e., a Cartesian grid projected over the topography). The model has been developed by Prof. Y. Shimizu from Hokkaido University, and it has been widely used for academic and consulting purposes in North Japan (iRic Nays2D Flood n.d.). for which h is the water depth, t is the time, u is the flow velocity in both the x and v in the y directions, g is the gravitational acceleration, H is the elevation of the water surface, τn are the shear stress in both x and y directions (directions denoted by n here), and ρ is the density of water, q is the inflow from extra culvert and r is the rainfall. The shear-stress is then described in term of velocity and roughness coefficient (Manning formula). Those basic equations in Cartesian coordinates are then mapped on the topography into curvilinear equivalent. 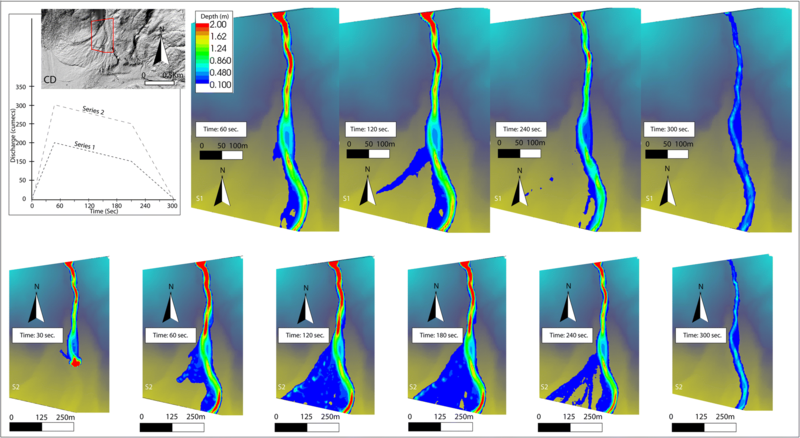 As the simulation is meant to be a rapid answer to potential hazards, it uses a simplified approach that does not take into account the water table nor the water loss in the pores of the sediments by infiltration. The Manning coefficient was chosen empirically as n = 0.05 corresponding to the normal value for mountain streams with cobbles and large boulders (Manning’s Empirical Table n.d.). The simulation hydrographs are for a period of 5 min each, with instantaneous maximum peak flows at 50, 100, 200, and 300 m3 s−1 with the peak flow reached at 60 s. The flow then decelerates to 0 (Fig. 6). The choice of such short interval was motivated by the needs to represent a flash flood, as they have been reported during heavy rain events. The choice of a Newtonian flood simulation over a debris flow model has been motivated by the quasi-absence of fines (fine sand, silt and clay) that would support the larger clasts in a typical debris flow. Their transport is mostly the role of gravity and steep slope. Walking on the fans, one would notice the dominance of large clasts and the lack of fine materials. For this reason, the model describes best the flood series on the fan. Finally, the simulation is meant as a hazard analysis system for rapid response, not for sediment transport analysis. The geomorphology of the valley consists in a valley bed and steep slopes with different geomorphologic features connecting them. The valley walls are steep and command topographic variations of more than 1000 m on both sides of the valley (Fig. 3). The slopes are characterized by bedrock eroded by the Fox Glacier as well as a mantle of debris also deposited on the side of the glacier. As the glacier recedes in length, it also loses volume and height, explaining the topographic break that can be observed along the valley (a and b on Fig. 5). These topographic breaks decrease in altitude towards the center of the valley. These step-like features are then reworked by two processes. If the location of the slope breaks, or the “nose of the step” is related to the ice position, it is being reworked by fluviatile activity that cuts rills through it, perpendicularly to the main valley (Fig. 5) and the horizontal surface of those features adopts a gentle sloping profile as the debris flow and fluviatile processes create fans covering partly the glacial deposition features. As the lower parts of the slopes have only been uncovered by ice in recent years (see “1 s” on Fig. 5c), they are active locations that tend to produce material deposited in 6 (Fig. 5c) while also being progressively packed while the interstitial ice melts and part of the material is being eroded away in the Fox River. The geomorphology of the bottom of the valley is shared between the straight channel of the Fox River growing into braids and the debris flow fans that make the contact between the tributaries and the valley. The fan that developed downstream Straight Creek and Fork Creek (Fig. 5c “3”) is uneven between its true left and right side. The true left side of the fan is much more developed spatially and it is thicker, while the right side is less developed and also thinner. On this thinner section, we can also observe two different levels with a slight nose feature. This characteristic has been observed to be related to the ice retreat as late as 2013. The fan of Yellow Creek is the second fan in size in the valley and it is located slightly downstream the Straight Creek fan (1 in Fig. 3), and this one is comparatively more homogeneous on both its true left and right sides. Longitudinally, however, it is not homogeneous and the topographic “noses” that also exist on the slopes are to be found at the same altitude on the fan as well. This indicates that a single process must have shaped both the valley walls and remodeled the fans: the presence of ice and its retreat, which leaves the step-like features. For all the fans, the grain size of the material range from sandy and coarse sand matrix to boulder size material typically less than 1 m in diameter. The material angle is semi-rounded showing the influence of water in the transport but not sufficient to generate typical river gravels. Among this material, one also can find outsized blocks that can be more than a 5-m diameter and that typically display subangular characteristics, relating them to fall events from the upper slopes. The geomorphology of the fans therefore indicates high-energy events, even if one keeps apart the occasional rockfall events. As the tourist tracks run over Yellow fan and White Creek fan (see the track on Fig. 4), it is necessary to better understand some of the related hazards, and we present here flow simulation results on Yellow fan, which is the largest portion of the present track to the view point to the glacier (Fig. 6). As potential scenarios are numerous, the authors generated different wave-phenomena that can be linked to a peak rainfall or a dam break from the upstream landslides. For the scenario “series 1” (Fig. 6), the short-peak release (effectively a second at peak only) shows that the water diverges from the main channel on the right side and flows into another channel about the center of the fan. Another scenario with a slightly larger amount of water (series 2) shows that no spill happens on the true left side of the channel on the fan, but on the true right side, the flow is not constrained in a channel anymore and runs as a sheet-flow over a large portion of the fan. It is therefore possible to determine areas that are potentially safer than others when crossing the fan, and this would be on the upstream side of the fan. The present contribution is organized around two steps: (1) a geomorphologic description and analysis of the valley and (2) example of flood simulations on Yellow Creek fan using the geomorphologic data as boundary conditions. The geomorphology shows that the steep slopes are connected to the valley by debris flow fans at the exit of tributaries and by sediment aprons at the bottom of the slopes. The slopes present several topographic steps or noses on both the aprons and the debris flow fans. By comparison with the glacial recession (Purdie et al. 2014), they can be related to past locations of the limits of the glacier. On Straight Creek fan, the ridges are perpendicular to the valley and divide the fan between an overgrown half downstream the Fox Valley and an upstream section thinner and smaller. This pattern was also created by the presence of the glacier that stopped the development of the fan on its true right (upstream half) while developing the true left hand side of the fan. On the other side of the valley, the debris flow fan of Yellow Creek presents a series of deep trough that control water flows. Flood simulations show that these controls can be overcome, and instead of being channeled in other sub-channels, the flow tends to spread on the right (downstream) end of the fan as a sheet flow. In the 2014 state of the fan, the safest location was thus on the true left half of the fan towards the glacier. Such information is essential as tourists occupy the valley and walk towards the glacier the whole year (Purdie et al. 2015). This short study presents a set of compelling evidences explaining the necessity to develop further 3D point cloud technology in order to monitor our environment with higher frequencies than the traditional methods. Active Alpine Valleys combine sets of difficulties to whoever wants to capture the geomorphology of those environments. Firstly, the valleys are often narrow offering only a very limited sky-opening. Topographic, and often vegetation (Zimbelman and Keefe 2018), often affect the quality of the topographic measurement, through a process known as positional dilution of precision (PDoP), which is an index representing the impact of satellite visibility on the measured topography (Johnson and Barton 2004). PDoP increases the error margin on measurement in mountain areas. In Northern America, research on PDoP has shown that a low-visibility below 20° azimuth towards the South was an important source of error (Karsky 2004). Such error further increases under vegetation cover. This lack of sky-access has a direct effect on the potential use of satellite positioning, but it also has indirect effects how much of the terrain is effectively captured through satellite or any other airborne technology, because the position above the valley only offers NADIR or near NADIR angles, while the slopes develop profiles that can be subvertical, offering little grip to a NADIR image. It is therefore essential to downscale the data sampling method in such a way that the tool can be brought inside the valley itself, to capture the subvertical slopes. This method is however not a silver bullet because the limited sky-access puts a constrain on the potential use of satellite-based geodetic system and navigation system of the UAV. At Fox, although there are enough satellites to perform RTK-GNSS surveys, there were not a sufficient number of satellite visible near the valley walls, and for this reason, the UAV-automated flight testing was not successful. Providing that instruments are brought in the valley and that data are collected, the next difficulty to be dealt with in such dynamic environments is the fact that “everything moves,” even the slopes that seem rather stable creep and there is little if not virtually no potential control point that can be kept from one season to another. This renders the comparison of DEMs, point clouds, and any form of geodetic measurement difficulties. It is therefore important to know that reasonable amount of error might be introduced and that one should not pay too much attention to centimeters to decimeter variations in X, Y, and Z. One of the possibilities to overcome this difficulty would be to “bring” reference points from outside the valley, through a series of theodolite or total station measurement, in order to measure the variation of a reference point, in such a way that any movement of such point could be quantified and then all relative change can be also measured. Similar results could be obtained from having a fix GNSS station recording data continuously in the valley. Because of the rapid glacial retreat phase that is happening in the Fox Valley (Purdie et al. 2014), the sediments trapped in the tributaries make their ways very rapidly to the main stem of the Fox Glacier valley. Therefore, the junctions between those valleys evolve very rapidly as well at the week to month scales. 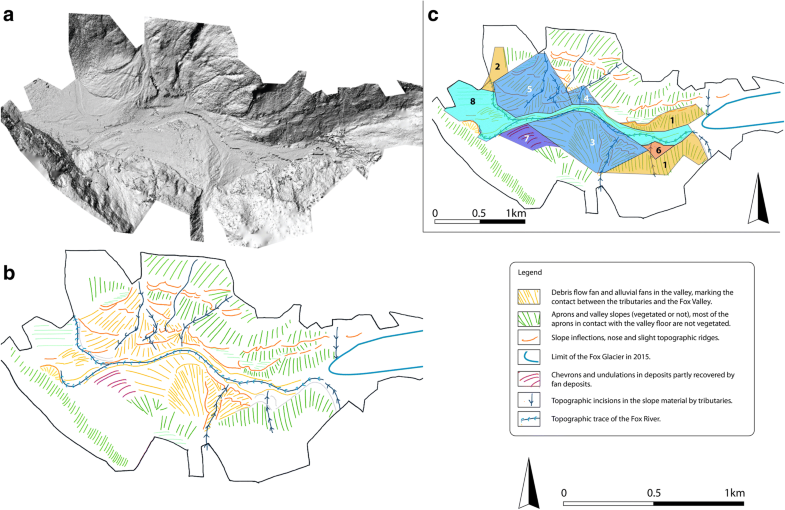 In turn, this rapid evolution poses a real challenge to the valley manager because the hazards are ever changing and especially rockfalls and debris flows can have very different pathways (Purdie et al. 2015). Consequently, collecting a high-resolution dataset using traditional theodolite surveys or solely RTK-GNSS to construct a terrain model is too time-consuming and it is likely that the fan shape will have changed between the start and the end of the survey. Furthermore, the resolution is not sufficient either to run flow models at the adequate resolution. The use of a “dense” point cloud is therefore essential, in order to capture the complexity of the terrain, which will play an essential role in controlling potential debris flows on the fan. This has been emphasized by the recent survey on debris flow channels in Switzerland (Schürch et al. 2011). It is also important to note that the method used in the present study is well suited for hazard estimation, but for diachronic analysis for instance, there is a need to increase the number of control points and understand how the error propagates through the point cloud and then the subsequently constructed DEM (Brasington et al. 2003). The flood simulation shows that rainstorm or a flood due to the release of an upstream impoundment (the headwaters have several active landslides that will block the main channel when they move) will produce an increase of flow height in the upstream reach, due to the narrow and deep channel, which then spill over the fan. Although the flow seems to be unlikely to run over the man-made levee on the true left of the main channel, the overland flow is likely to flow across the true right of the fan. One must however remain cautious and only use it for hazard likelihood assessment, because the model works over a fix bed, which does not allow erosion or sediment transport during the flow. Moreover, the driving equation is the one of a Newtonian flow, that works fine for a typical flood, but is less accurate for debris flows. Glacier recession is the present trend, but the Fox Glacier has shown through a general recession trend series of short advances, which, if they were to occur again, could block the tributary valleys once more and trigger temporary reduction in sediment feeding before eventually freeing further sediments again. Further developing the monitoring methods that we discussed in the present discussion is therefore essential. Ideally, data could be crowd-sourced or collected semi-automatically, in order to match valley rhythm and survey frequency, and by then reassess various hazards such as flood hazards on fans, using photographs taken by people including local managers and tourists, which are used to generate multitemporal topographic models, as it has been already proposed for the conservation of cultural heritage (Inzerillo and Santagati 2016) and archeological sites (Griffiths et al. 2015) using donated photographs. In relatively data-poor areas like the Fox Glacier valley, UAV-based photogrammetry and the point cloud generated afterwards can be a very strong combination for managers and scientists to collect (even crowd-source) the necessary data to ensure the security of the public, and with the decreasing prices of the technology, it might become available to the greater number, even in “developing” nations where data is often the weak link. This research has been funded by the Mason Trust Funding and supported by the Geography Department at the University of Canterbury in New Zealand. The authors are in debt to the technical team of the Geography Department (Justin Harrison, Paul Bealing, and Nicholas Key) for their help, advice, and equipment maintenance. The research was funded by the Brian Mason Trust Fund to study the Fox Glacier and awarded to the two authors. The RTK-GNSS points are available upon request to the author, providing proper citation of the present work. Both authors (CG and HP) contributed to the field work and the data processing, while the write-up was led by CG. Both authors read and approved the final manuscript.